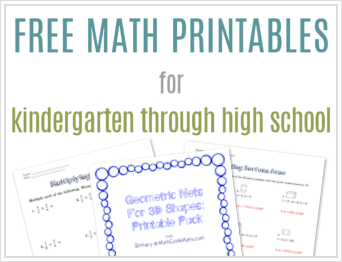 Are your kids ready to tackle decimal operations? Multiplying decimals and dividing with decimals is certainly a challenge. But it doesn’t have to be a source of frustration and tears! 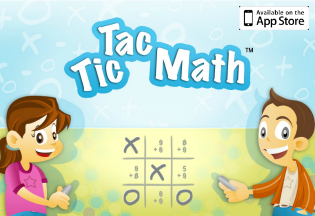 With this simple game, kids can practice multiplying whole numbers by decimals, dividing whole numbers by decimals and so much more. 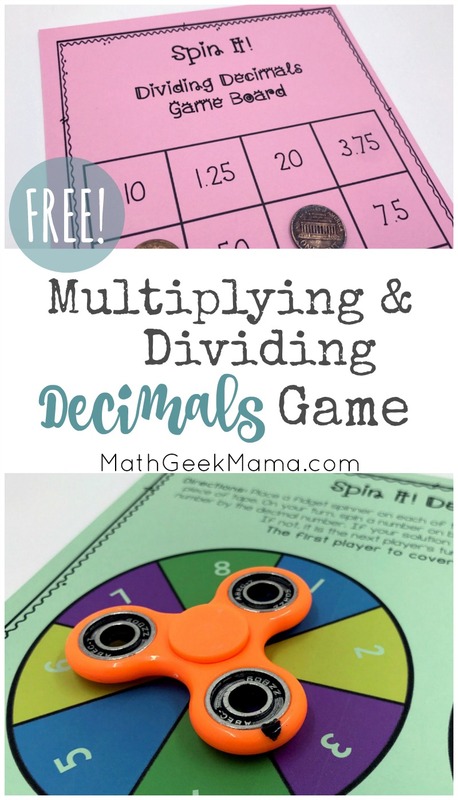 And with the addition of a fidget spinner, your kids are sure to love this multiplying decimals game! This game is super easy and low prep. 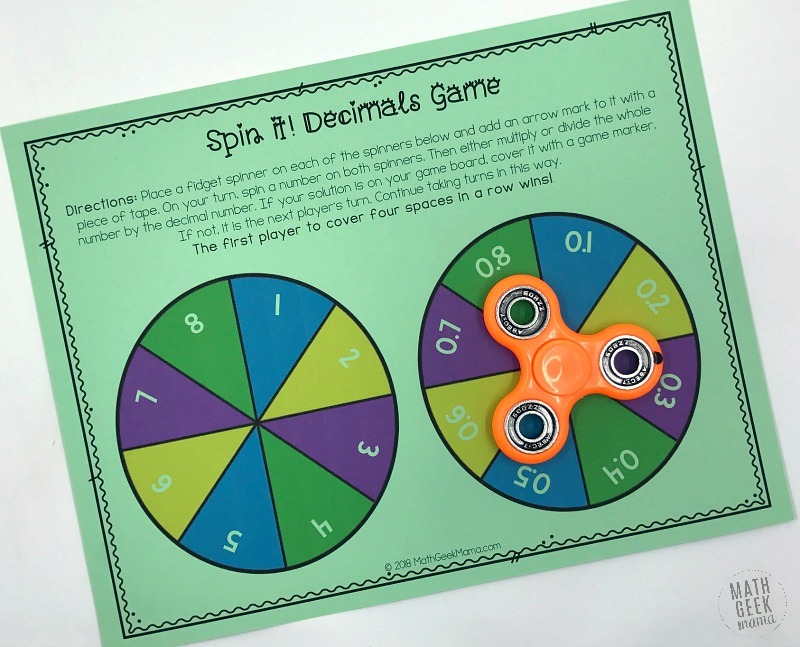 To get started, you will need to print the spinner page and the multiplication game boards. 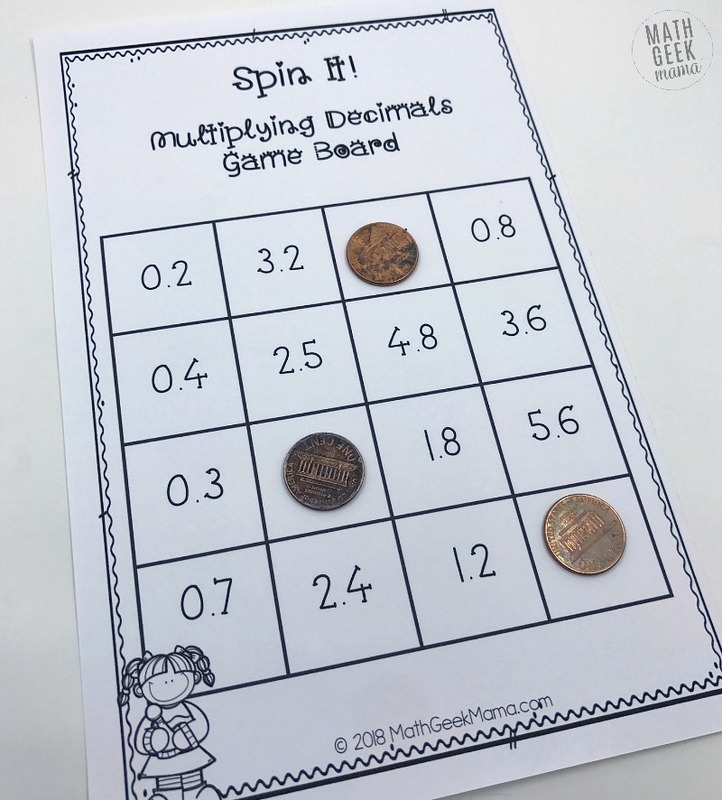 The download includes 4 Bingo style game boards for multiplication, but there are also blank game boards if you need to make more for more players. Each player needs their own game board and game markers. This can include coins, blocks, unifix cubes, etc. or if you laminate the pages, kids can simply cross answers out with a dry erase marker. Then erase when you’re finished and you can play again! You will also need something to use for your spinners. I suggest using a fidget spinner, but you can also use a paper clip and pencil. Notice that on my fidget spinner I used a marker to make an “arrow” to be the pointer of the spinner. You could also use a small piece of tape. I also printed the different game boards on different colored card stock paper, just to give it some color and help differentiate between the different games. This is entirely optional though! Once all the set up is complete, you’re ready to play! There are several different variations you can play with this game. The first is multiplying whole numbers with decimals. The solutions on the included game boards are designed for this version. To play, kids spin a whole number on the first spinner, then spin a decimal on the second spinner. They then multiply those numbers. If the solution is on their game board, they can cover it with a game piece (or cross it off). Players take turns spinning and multiplying whole numbers and decimals and marking the solutions on their game board. The first player to cover 4 in a row on their board wins! Because the numbers included on the spinners are friendly numbers, this would be a great way for kids to practice their mental math skills. Simply challenge kids to multiply mentally, and then let another player check the answer with a calculator. If it’s correct, they can cover that solution. If not, they lose that turn. 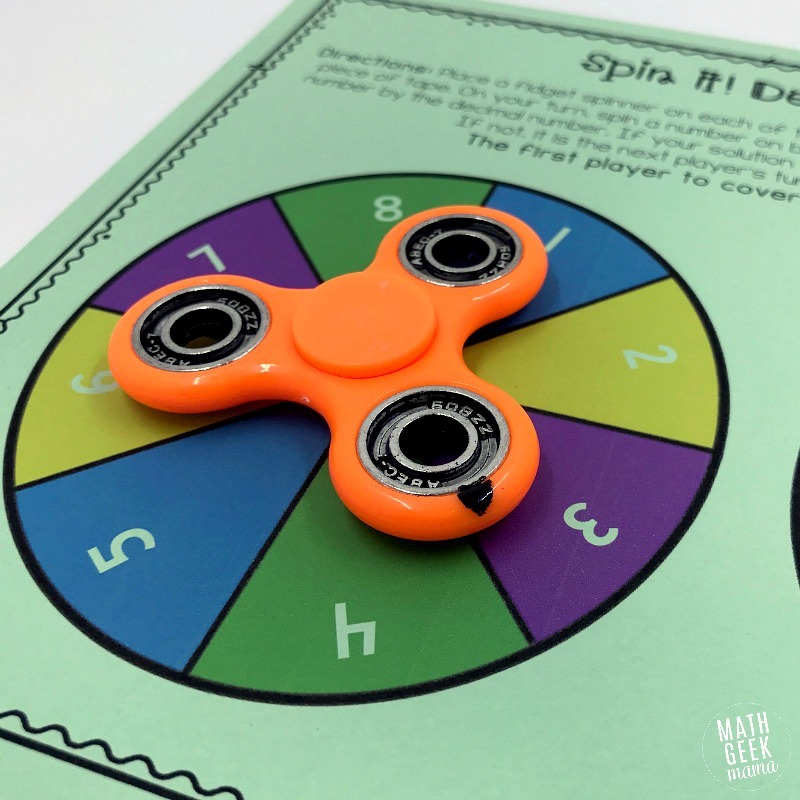 If your kids need a greater challenge, you can use the decimal spinner twice. In other words, kids can spin a decimal number twice, and multiply those two numbers instead. There are not game boards created for this variation, but there are blank game boards. So you could prepare some ahead of time with possible solutions, or you could find possible solutions as a group and let kids create their own game boards. This would be a great time of review, as you discuss how to multiply decimals, and what the solutions would be for these given numbers. Then kids could play in small groups or with a partner for additional practice. 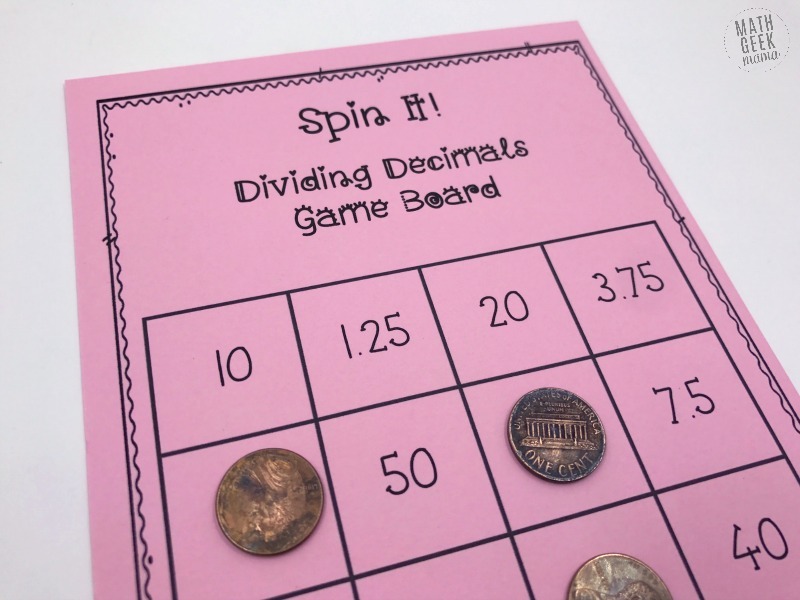 Finally, you can use the spinner board to practice dividing whole numbers by decimals. The download does include 4 game boards for this variation, so you can just print and play. The game is played the same way, and kids begin by spinning a whole number and then a decimal. Then instead of multiplying the two, they divide. But again, for greater challenge and variation, you can have kids divide the decimal by the whole number. You will need to create your own game boards for this, but it’s another way to use this game and provide additional practice for kids. One last variation that might be a fun challenge if you have kids who are up for it, is to ask kids to find all the possible solutions for the given numbers and then to find the probability of each. 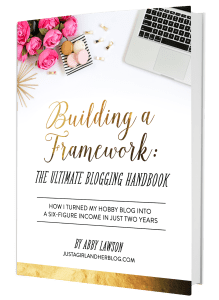 This is a great enrichment challenge, and will show kids that if they’re creating their own game boards, they can be much more strategic with what solutions they include and where they place them. Some solutions can be found multiple ways, meaning there’s a higher probability of getting that answer. Of course, there’s a bit of chance involved with this game as well, so it’s not a guarantee, but it would be great for kids to think a little deeper about what solutions they choose to include if they’re creating their own game boards. It would also be fun to look for patterns in the possible solutions. For example, why will you get 3.2 multiple ways? Why do some answers have such a greater probability? 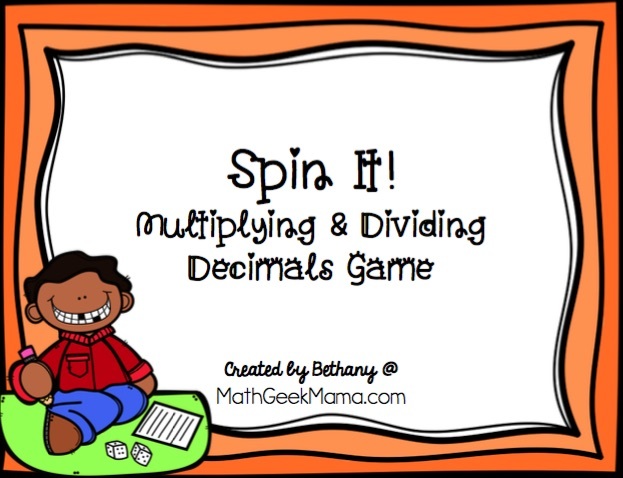 However you choose to use this game with your students, I hope it is fun and a great chance for not only practice multiplying decimals, but some great math talk as well! Need more practice with decimal operations? Check out these fun maze worksheets!